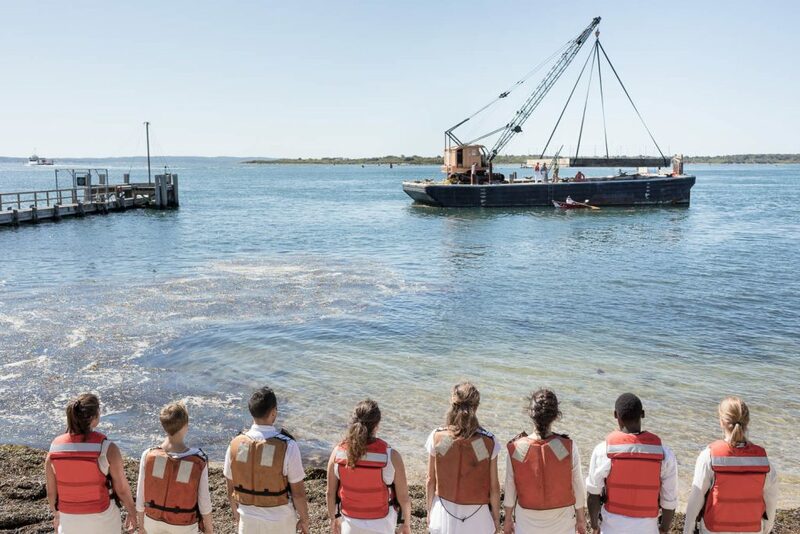 Heather Clark is the first artist-in-residence at the Woods Hole Research Center, the leading climate change think tank in the country. From her interviews with climate scientists, she developed an DISSONANCE, an artwork that was produced off the coast of Woods Hole, Cape Cod this past summer. 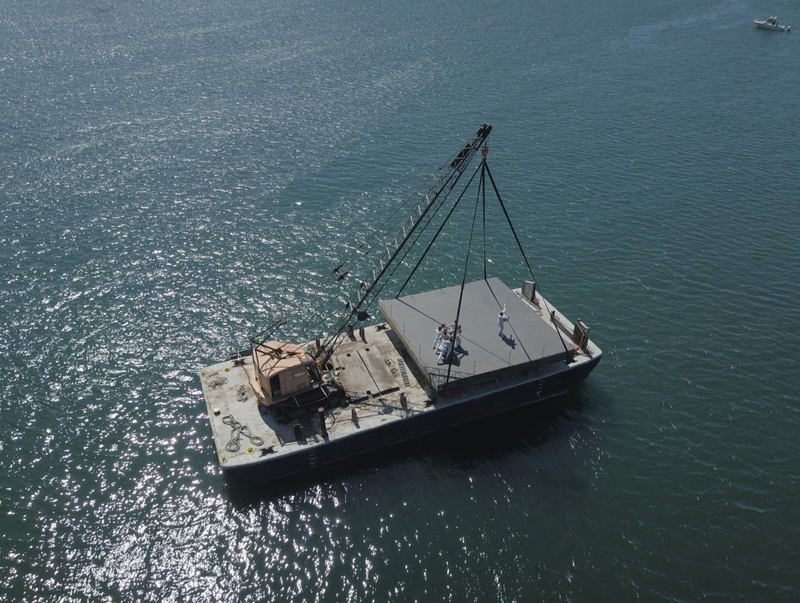 The piece was a performance on a barge in the ocean. The DISSONANCE project unveiled photography and film to coincide with the conclusion of the United Nations COP23 Climate Change Conference. 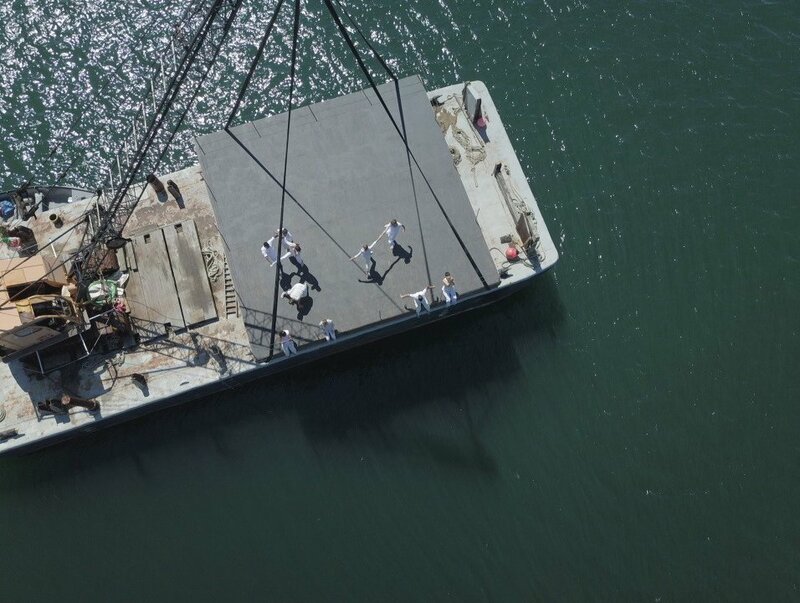 In this artwork, American visual artist Heather Theresa Clark confined dancers to a platform that appeared suspended from a marine crane. Dwarfed by the crane and the scale of the barge at sea, identically clad dancers became small and anonymous. DISSONANCE embodies the psychological barriers of addressing climate change and the emotions that many of us experience, because of the overwhelming scale of the crisis – troubled that our fossil fuel-based economy could be permanent, yet yearning for solutions. Photography and film, produced in collaboration with Gretjen Helene, is a new body of work from this performance-based art intervention. Earlier this fall, Clark presented this work with The Yard, as a live performance off the coast of Cape Cod to an audience on shore. To create DISSONANCE, she teamed up with The Yard’s resident dance collective, Dance the Yard, who choreographed this original piece; photographer Gretjen Helene; musician Christen Lien; cinematographers Daniel Cojanu and Scott Jansson; and over 50 volunteers who desire action on climate change. 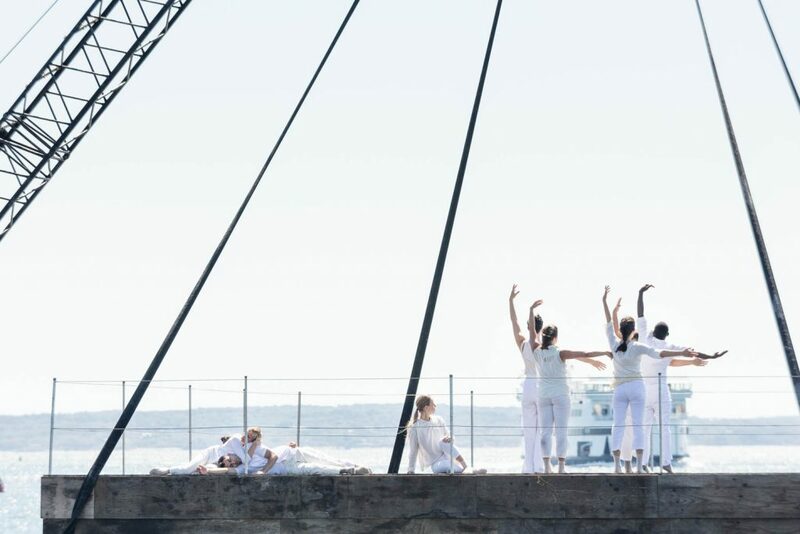 In DISSONANCE, dancers are rowed to a barge at sea, where they are overshadowed by its industrial limitations (framed and staged by the marine construction barge, crane, platform, and cables). They move within a system they cannot control. The actors have accepted the constraints of old industry and consented to its limitations, despite the broader possibilities that are available from their surrounding environment (wind, water, sun). If we look closely, we see the dancers’ individuality, relationships, emotions, and humanity. The dancers are vulnerable humans existing, interacting, and shifting balance according to the structure of industry that holds them up. Dories that transport the dancers to and from the barge serve to remind us that the objects we use in daily life for entertainment and enjoyment are elsewhere being used in survival emergencies, as climate change takes effect on our world. DISSONANCE emerged from the unsettling emotion Clark experienced while interviewing over 20 climate scientists at WHRC and other leading science institutions on Cape Cod. During the interviews, her world view shifted and she felt pained by the climate data that measures and forecasts our climate crisis – the effects on humans and nature are catastrophic. However, in parallel to the interviews, she was enjoying an exquisite summer with family and friends on the beaches of Cape Cod. She transferred the experience of cognitive dissonance into the work’s visual cues. How could climate change be happening in a landscape that looks this pleasant? DISSONANCE marks the beginning of a larger artistic inquiry. Its oversized-photography and film will be presented in some disorienting contexts this coming year. The photographs and film are a result of a collaboration between Clark and Helene to produce a stand-alone conceptual photographic piece that exists beyond the live event. They hope to stimulate conversation around the climate crisis, our struggles, our reliances and the greater possibilities that exist. “These large-scale scenes can serve to stir the emotions around climate change on a visceral level by demonstrating the relationship between humans and the industries we depend on, and delivering a view of humanity struggling on a tipping, swinging, unbalanced structure,” says Helene. 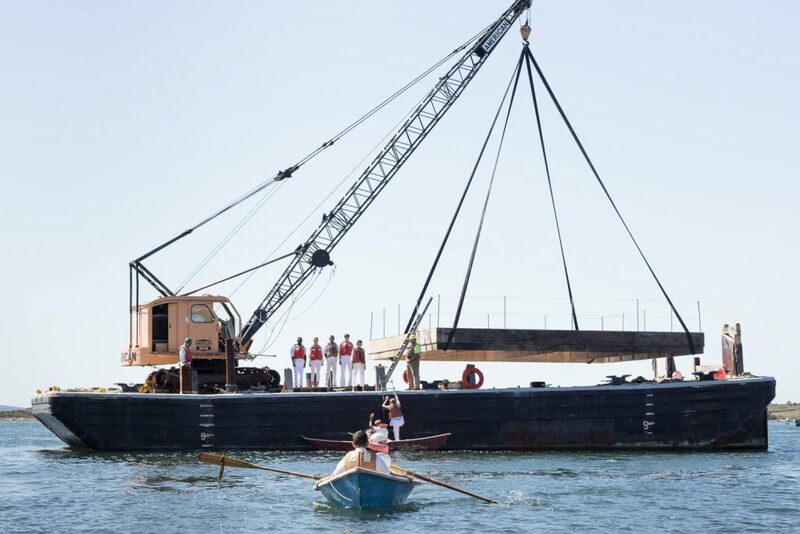 DISSONANCE was presented off the coast of Woods Hole, Cape Cod, Massachusetts as a one-hour performance. Orchestrated by Clark, DISSONANCE was a community effort, supported by over 50 volunteers, including all the artistic contributors, who desire immediate action on climate change. The region is an especially relevant location for climate change artwork. The area is home to many top tier scientific institutions. Woods Hole is also situated on the coast, and like most coastal communities, is susceptible to sea level rise. Original photographs of the event have been altered in the final artistic presentation of DISSONANCE, as a stand-alone conceptual photographic body of work. Woods Hole Research Center (WHRC) is an independent, non-profit research and policy center based in Falmouth, Massachusetts. Our scientists study the causes, dynamics, and consequences of the changing climate and the actions needed to reduce climate change impacts. We focus our work on forests, soils, and freshwater systems – across North and South America, Africa, and Asia. WHRC scientists work to control climate change by preventing land-based carbon from being released – and by driving efforts to capture carbon from the atmosphere using natural vs. biological systems. We engage in climate policy development at all levels, from local and regional governments across the world to international bodies like the United Nations. WHRC has been recognized for three years running as the world’s #1-ranked independent climate change think tank by the International Center for Climate Governance. DanceTheYard (DTY) is Martha’s Vineyard’s award-winning dance center The Yard’s resident dance collective. Co-directors and choreographers Alison Manning, The Yard’s Executive Director, and Jesse Keller Jason, The Yard’s Director of Island Programs & Education (with Artistic Advisor David R. White), have been building a body of work and presenting an annual weekend of performances each summer, as part of the Yard Arts season. 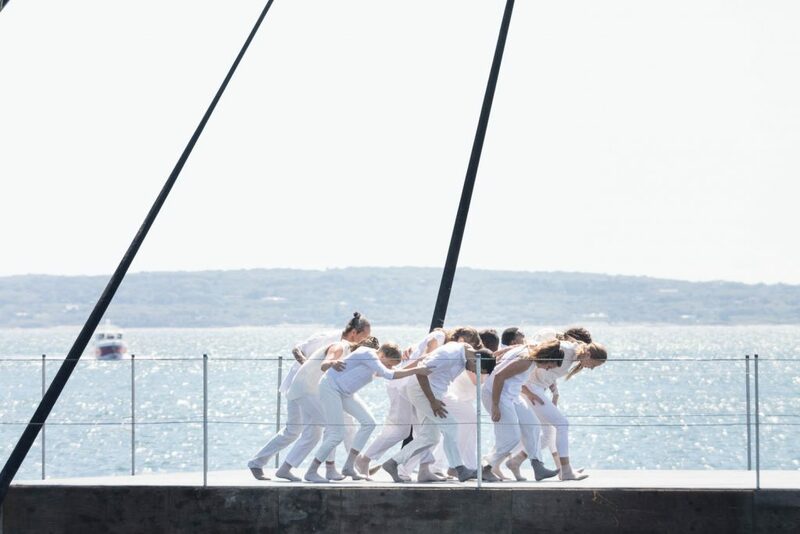 DTY is comprised of professionals living on Martha’s Vineyard and in New York City, and each member has become a part of The Yard’s greater service mission: working together to present performances for the public, participating in educational residencies and dance making programs for children and adults, along with other community based events around Martha’s Vineyard. Each component of DTY’s work contributes to The Yard’s overarching mission of support for emerging choreographers through residency and financial support, dance and related arts presentations, and a commitment to arts education in the local and national communities. Gretjen Helene is an American Visual Artist who primarily works in Photography and Integrated Media. Her work spans many visual based mediums as well as sculpture, new media, interactive installation, curation and fine art photography. Her interest lies in increasing awareness of important issues that face our community and humanity today. While collaborating on Artistic interactive installations that ask viewers to contemplate alternative realities she also works as a Professional Photographer for non-profit organizations in order to generate marketing and promotional materials that will enhance the Rights, Skills and Enjoyments deserved by all, but underserved to many. Christen Lien’s provocative compositions, hypnotic performance style, and entrepreneurial business approach all reflect her passion for challenging the status quo. Through her art she seeks to support her fans to process the complex and oftentimes dark emotions that oppress individual potential and hold back collective power. A mesmerizing performer, Christen has brought her act to a variety of venues and contexts, including the House of Blues, REDCAT and Zanzibar; museums such as the de Young, Legion of Honor and Detroit Institute of Art; as well as influencer events such as the White House Summit on the United State of Women, Curiosity Camp, Nexus Global, SOCAP and Summit, and has performed for His Holiness the Dalai Lama. Photo Credits – Gretjen Helene, Photo Credits (drone) – Scott Jansson.